Discover Frank Lloyd Wright architecture. See the Sikorsky S-38 replica plane. SC Johnson’s company tours are not to be missed. You may know us only for our brands, like Glade®, Raid®, Windex® and Ziploc®. And that’s great, because we love being part of your home! But you might be interested to know about our home, too. 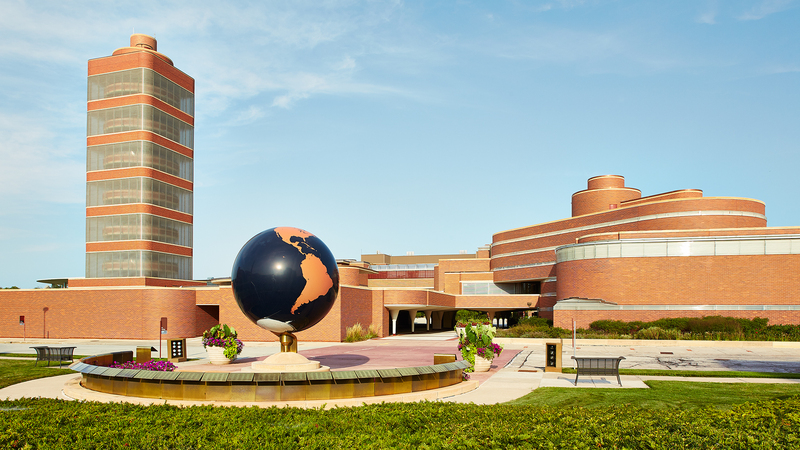 Located in Racine, Wisconsin, SC Johnson has the only remaining Frank Lloyd Wright-designed corporate headquarters that’s still in use. We also have an award-winning Foster + Partners-designed building, a gallery featuring Frank Lloyd Wright-focused exhibits, acclaimed films, and a replica twin-engine S-28 amphibian plane with a story that will touch your heart. Come see it all for yourself. We love to show visitors around our architecture and campus. The Great Workroom in the SC Johnson Administration Building. Frank Lloyd Wright-designed Administration Building, including the remarkable Great Workroom. Frank Lloyd Wright-designed Research Tower, reopened in 2013 after an extensive restoration. Fortaleza Hall, designed by Foster + Partners and featuring the replica twin-engine S-38 amphibian plane that Sam Johnson flew to Fortaleza, Brazil in 1998. 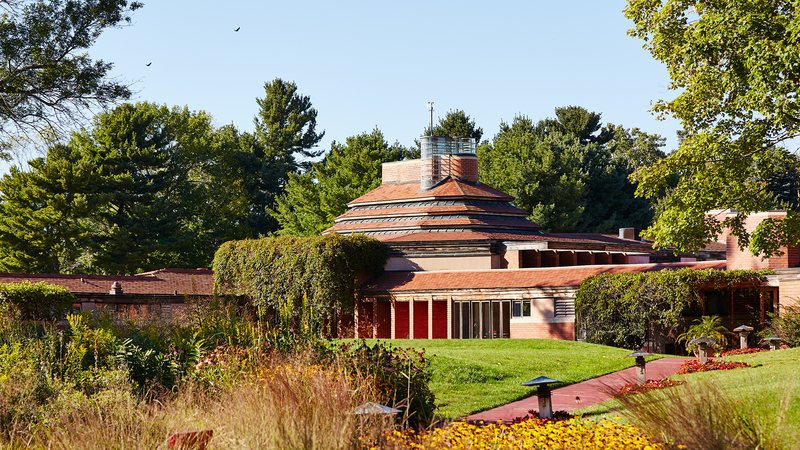 The SC Johnson Gallery: At Home with Frank Lloyd Wright, home to a rotating series of exhibits showcasing Wright’s influence on families and the home. Film showings of the Academy Award-winning documentary To Be Alive! and the acclaimed Carnaúba: A Son’s Memoir at The Golden Rondelle Theater. The Lily Pad, a unique gift shop featuring exclusive SC Johnson memorabilia and brand merchandise, as well as Frank Lloyd Wright-inspired items. Wingspread, the home designed by Wright for H.F. Johnson, Jr.
SC Johnson visitors can add a side trip to Wingspread, the iconic, Prairie-style home Frank Lloyd Wright designed for our third-generation leader, H.F. Johnson, Jr. Tours of Wingspread are also free and open to the public. At 14,000 square feet, Wingspread is the last and largest of Wright’s Prairie-style houses. Wingspread is about five miles north of SC Johnson’s campus in Racine. Sam Johnson’s replica S-38 amphibian aircraft soars at the heart of Fortaleza Hall. Company Tours: Ready to See SC Johnson and Our Inspiring Architecture? We offer 90-minute tours Thursday through Sunday. Tours are free and open to the public. Advanced reservations are required so we can make sure everyone can be accommodated. If your group has more than 20 people, call us at 262-260-2154 to make special arrangements. SC Johnson tours begin at The Golden Rondelle Theater, at 1525 Howe Street, Racine, Wisconsin, 53403. See map. Wingspread tours are at 33 East Four Mile Road, Racine, Wisconsin, 53402. See map. Click here for information about visiting Racine. We look forward to sharing our home, our history and our architecture with you. By car: From southbound I-94 and northbound I-94: Take I-94 exit 333 heading east on Highway 20 (Washington Avenue) for approximately eight miles. Veer to the right when Highway 20 splits off at 14th Street. Go over the railroad tracks and through the intersection of 14th Street and Highway 32. The Golden Rondelle Theater is one block ahead on the right. We offer free parking on the east side of The Golden Rondelle Theater. By public transportation: For local transportation information, visit www.racinetransit.com or www.realracine.com. 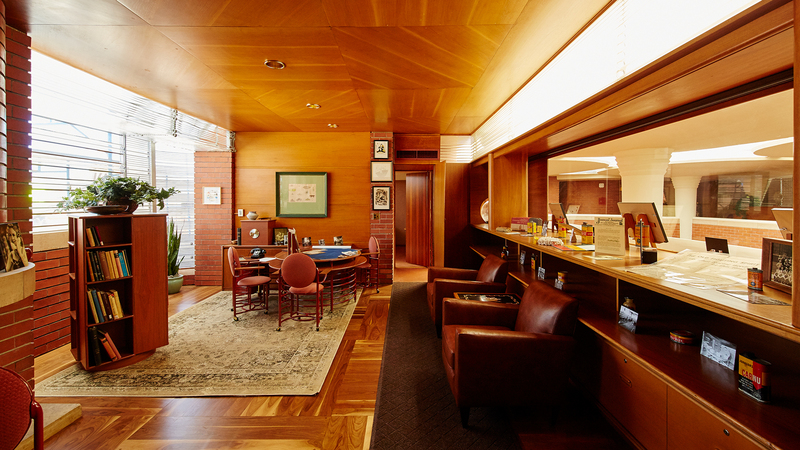 Get an in-depth look at the only Frank Lloyd Wright-designed corporate headquarters that’s still in use. We’d love to welcome you to our home in Racine, Wisconsin. We want everyone to be able to enjoy our tours. If you have a special need, please contact us 262-260-2154 or email Rondelle@scj.com prior to your visit. Though not physically strenuous, our tours do include standing, walking and climbing stairs both indoors and outside. Wheelchair-accessible elevators are available in Fortaleza Hall. The Golden Rondelle Theater and Fortaleza Hall are both walker and wheelchair accessible. The main floor of the Great Workroom is accessible via ramp. Stairs are required to reach the upper levels of the Administration Building. The Research Tower is accessible only via stairs. For the hearing impaired, we offer typed tour scripts in English. Upon request, we can also provide writing pads and pencils to facilitate asking and answering questions. Sign language interpreters are welcome, as well as certified service animals and white canes for the visually impaired. For the films, hearing aid compatible devices are available upon request. Bathrooms and water fountains are located in Fortaleza Hall. The historic office of third-generation leader H.F. Johnson, Jr., which is featured on some tours. Children are welcome, but parents should note that the tours are intended primarily for adults. We’ll be outside and inside, standing and climbing stairs. The campus is stroller-friendly, with the exception of The Gallery. Guests must remain with the tour and in sight of their tour guide at all times. If you have an issue during the tour and need assistance, please speak with your tour guide immediately. To protect and preserve the buildings, artifacts, designs and objects that you’ll see on the tour, food and drinks are prohibited. Also, SC Johnson is committed to maintaining a safe and healthful work environment for all employees and everyone who visits our campus. The company’s No Weapons policy prohibits weapons of any type, including concealed weapons, from its premises. 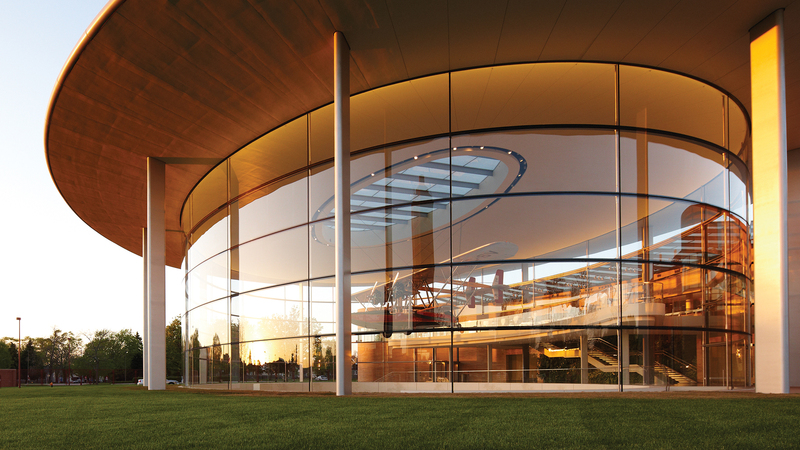 The Golden Rondelle Theater sits at the entrance to our global headquarters campus. Tours run rain or shine, including indoor and outdoor spaces. We recommend walking shoes, weather-appropriate clothing, and umbrellas as needed. We encourage the photographing of building exteriors — share them on your social media accounts and follow us on Facebook and Twitter at @SCJohnson. Photography and video of interior spaces, however, is prohibited during tours. If you’re a member of the media, please contact us at 262-260-2440 for special arrangements. 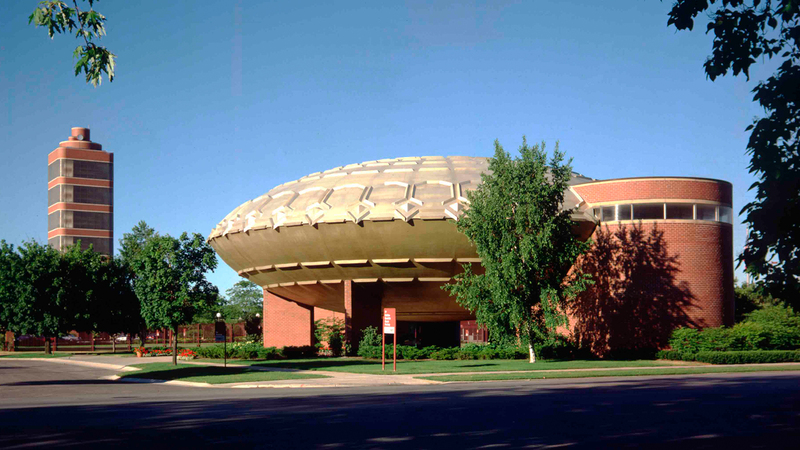 Our tours begin in The Golden Rondelle Theater, on our historic campus in Racine, Wisconsin. Schedule a visit to Wingspread, too. We look forward to seeing you.